Practically everything is in season right now! 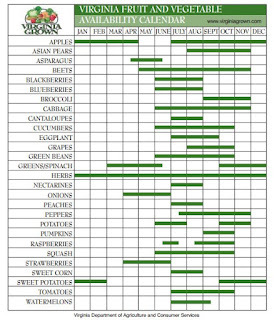 See full chart, courtesy of VDACS. 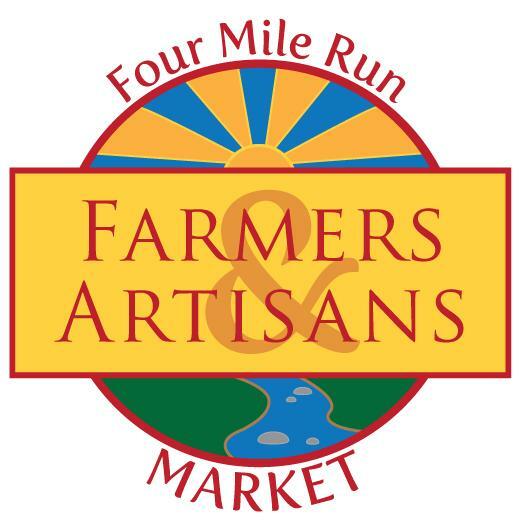 The 4MRMarket continues the string of musical acts this weekend with a local Mexican guitarist, Miguel Rivera. He will play from 11am-Noon. We have a lot of new, returning, or recently added vendors this weekend. Baguette Republic will be back with their fantastic breads and baked goods to add to the great offerings of market regular, Bread and Chocolate. New vendor Amalthea Ridge milks their herd of goats in Great Falls and makes great soaps and other beauty products. We also welcome Kayvee International, a vendor of fair trade scarves from India, for the first time this week. 4MRMarket has our great supply of produce, meat, cheese, crafts, breakfast treats, and more. 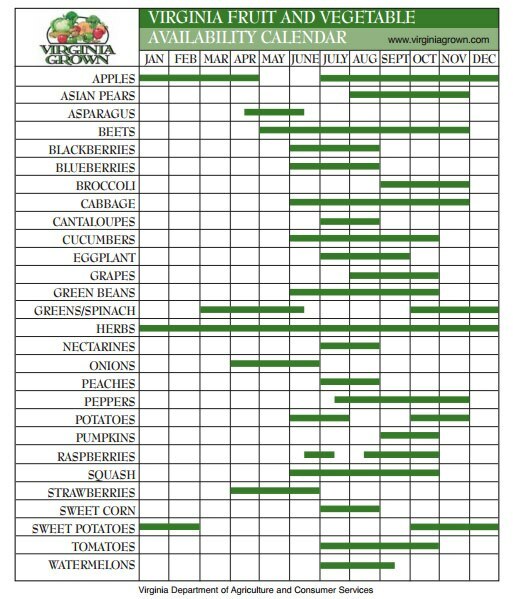 As you probably noticed in the chart shown, most everything is in season right now, so it's a great time for farmers market shopping. Grab some goodies, do your shopping, pull up a seat in the 4MRMarket Lounge, and listen to some great live music! In the community tent, we once again welcome Gina Renee' Peregory. She continues to raise funds for her participation in the Susan Komen 3-day 60 miler in October. You can help Gina's effort to support breast cancer research by donating at this website using Gina's participation number: 6507128. For donors, Gina is giving away custom printed T-shirts for every $10+ donation! So help breast cancer research, help Gina, and get a t-shirt to spread awareness. Bread &amp; Chocolate (Arlandria) - A range of baked goods. C &amp; T Produce (White Oak, VA) - A huge selection of locally grown produce from a locally, family-run farm in Stafford, Virginia. Amalthea Ridge (Great Falls, VA) - Natural, hand-made, goat's milk-based beauty products from their very own herd of goats. They work hard to bring to you scientifically formulated, hand made products that are both better for the environment and nourishing for your body. St. Elmo's) will be on the 4MR Stage Sunday from 11-noon. We welcome roots and folk musician Mike Elosh this Sunday on the 4MR Stage from 11am to noon. The concert is free, though Mike will gladly welcome tips and friendly applause. Please come out and support this Dylan-like folk rock singer/songwriter. Mike uses guitar, piano and harmonica to accompany his roots-based music. You may know Mike from his monthly performances at St. Elmo's Coffee Pub. It should be a great show, and a nice way to enjoy a beautiful August morning in the mid-to-upper 70s. 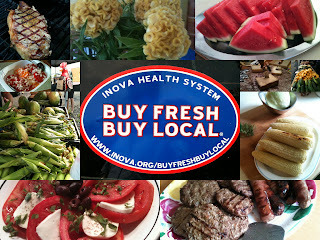 We'll have our usual fresh haul of produce, meat, cheese, crafts, breakfast treats, and more. So grab some goodies, do your shopping, pull up a seat in the 4MRMarket Lounge, and listen to some great, local music. This week we will once again have tasty cupcakes from SweetCentral Babycakes in addition to all our great regulars! In the Community Tent this weekend, we have Gina Renee' Peregory raising funds for her participation in the Susan Komen 3-day 60 miler in October. You can help Gina's effort to support breast cancer research by donating at this website using Gina's participation number: 6507128. For donors, Gina is giving away custom printed T-shirts! So help breast cancer research, help Gina, and get a t-shirt to spread awareness. The Stifler Farm aka "What's For Dinner Now" - Farm-raised Black Angus beef, humanely raised on lush pasture fields of the Shenandoah Valley, naturally farmed pork and, now, Uncle Frank's Grilling Sauce. Sweetcentral Babycakes (Springfield, VA) - Artfully crafted cupcakes in babycake and teenycake sizes from Elda. This is her first market, so please welcome her and give her delicious babycakes a try. rotating array of craft vendors. This Sunday morning should be sunny and a lovely mid- to upper-70s. 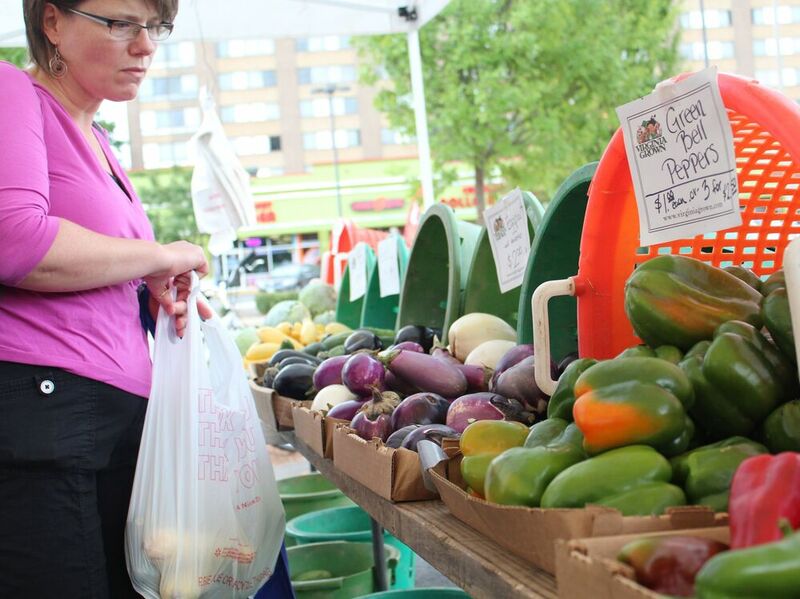 Take advantage of one of the few perfect mornings we've had this summer and come out to 4MRMarket for a fresh haul of produce, meat, cheese, crafts, breakfast treats, and much more. We welcome craft plates from Blooming Plates and organic health and skincare supplies from Josi Essentials in addition to all our great regulars! In the Community Tent this weekend, we welcome a group of kids from Arlandria non-profit Community Lodgings that are working on educational gardening projects. Blooming Plates (Virginia) - Sandra has 20 years of experience crafting with paper. She combines colored paper and glass to come up with beautiful decorative plate designs. 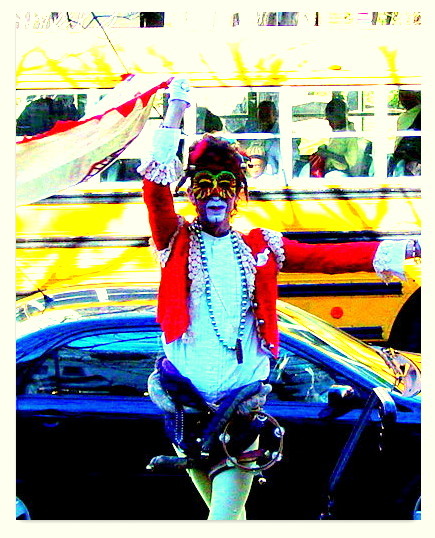 We welcome a "fools and jesters" style performer to the 4MRMarket Stage this Sunday between 10am and 12noon! La Compania del Bouffon / The Bouffon Company is coming!! David Camero, the company's artistic director is an experienced actor originally from Venezuela who is fluent in English and Spanish. David also sings a variety of songs in English, Spanish, French, and Portuguese. (Times may vary). 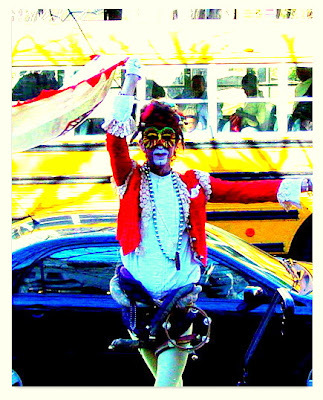 Using the Commedia del’Arte as poetic expression… In which the extravagance of jesters and jugglers as the main representatives of the performance. Their commitment is: "Laughing is the healing of the soul". David also sells old fashioned dolls, masks, pins and broaches. He will offer those for sale at 4MRMarket as well. This is a free performance for free (donations accepted) as a service to 4MRMarket and to share his craft, so please come out and support the arts this Sunday at 10:00am. And please help support the arts in Four Mile Run Park by supporting the artists. Once again, 4MRMarket have delicious cupcakes from Sweetcentral Babycakes this week...and all the other fresh, natural, delicious goodies, plus a few crafts and the all natural skincare products from Ephesian Beauty. Be sure to check out each vendor this week. You might find something you hadn't noticed before. Every week is a little different at 4MRMarket! Ephesian Beauty (Manassas, VA) - Pure, natural homemade skin care and beauty supplies.